A Playground for Your iPhone? Just don't use the lawn mower on this. The grass is always greener, and it turns out that's true for a lot of things we'd never even thought about. 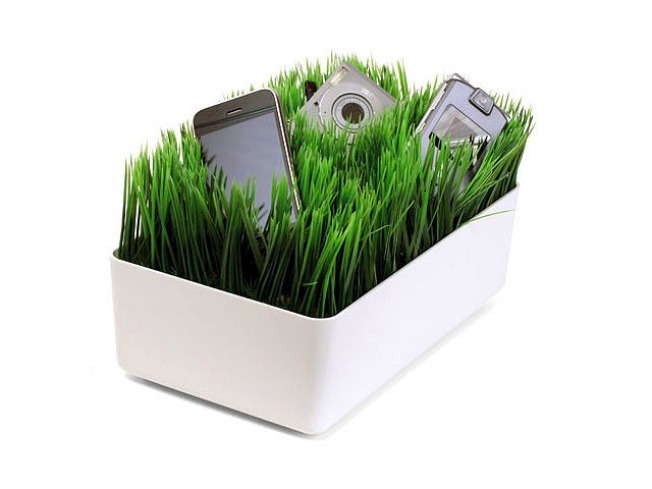 Like the Kikkerland Charging Station ($27), a handy little garden box of delights (AKA, fake but realistic-looking grass). Charge all your gadgets, including cell phones, cameras and music players, while keeping messy cords out of sight. iPhones may not grow on trees, but they just may grow on lawns. Luxury doesn't have to be expensive -- or even quite make sense. For a quick whiff of the good life, try a 24K Gold Gilded Bath Bomb ($5) by For the Love of Bathing, a D.C.-based e-store. The organic and all-natural bath bombs are scented with blueberry and orange, and gilded in 24-karat gold. Finally, the ring around the tub will be from something other than soap grime. In stores only, all cardigans at Urban Outfitters are just $29 each. Translation: time to get a jump on your fall shopping. Our recs: the Kimchi Blue Marled Tulip Open Cardigan (was $48) for women and the Standard Fading Fast Cardigan (was $58) for men. $29 deal available at 3111 M St. N.W., 737 7th St. N.W. and Tysons Corner.